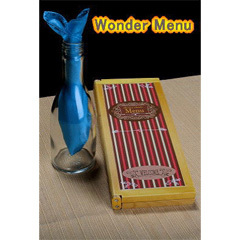 The performer shows an empty glass bottle or a water bottle to the spectator, and places it on the table. Then hand the menu to them. Have them look through the menu and get their attention to the names of Cocktails. There are Campari Orange and Blue Hawaii, and they see "which do you prefer?" on it. Assuming that they choose a Blue Hawaii, the performer takes the menu back and put it in front of the empty bottle. Then he does the magical gesture upon the menu and the bottle. When he lifts the menu, they see now an blue silk appeared in the bottle.